EDRA46LosAngeles took place May 27-30, 2015 at the Westin Bonaventure in Los Angeles, California. Questions? Highlights are below, but for detailed coverage of this event, check out our Facebook page and photo gallery! Evidence from nearly a half-century of environment-behavior research has provided us with a plethora of information on social, cultural, and psychological dimensions, and now neuroscience has the potential of adding another very significant and critical dimension. Amidst the forever stimulating landscapes of Los Angeles, opportunities to link EDRA’s legacy of environment-behavior research with the nation’s leading neuroscience institutions and scholars abound. 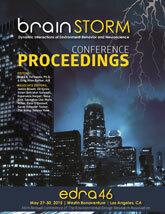 Taking advantage of this, EDRA’s 2015 conference, “brainSTORM: Dynamic Interactions of Environment-Behavior and Neuroscience” will have a specific thematic track on neuroscience that informs the relationships between environment and behavior. We invite you to be part of a generative and stimulating exchange in a city where environments, on screen and off, are legend. 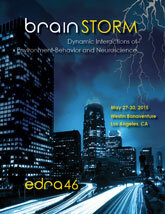 At The final EDRA46LosAngeles schedule of presentations is available for download. Click here to view a searchable PDF file of all accepted oral and poster presentations and the CEU credits associated with each session. 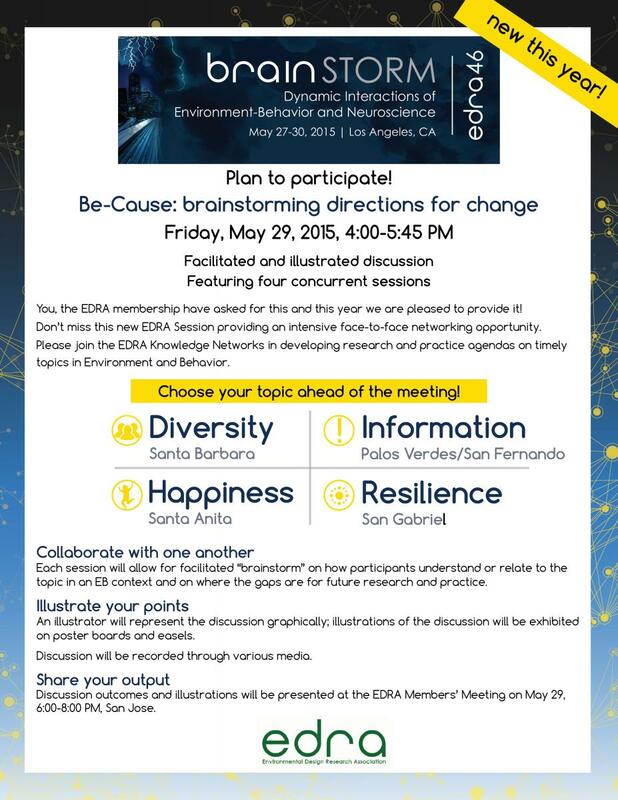 EDRA introduced a new session to it's annual meeting this year; the Knowledge Networks Brainstorm Session. With the themes of happiness, information, diversity and resilience, the session provided an intensive face-to-face networking opportunity. Read more here.